When Carlota Ciganda hit her shot into a hazard on the 15th hole, officials took nearly a half hour to make a ruling on her drop -- a ruling that proved to be wrong. 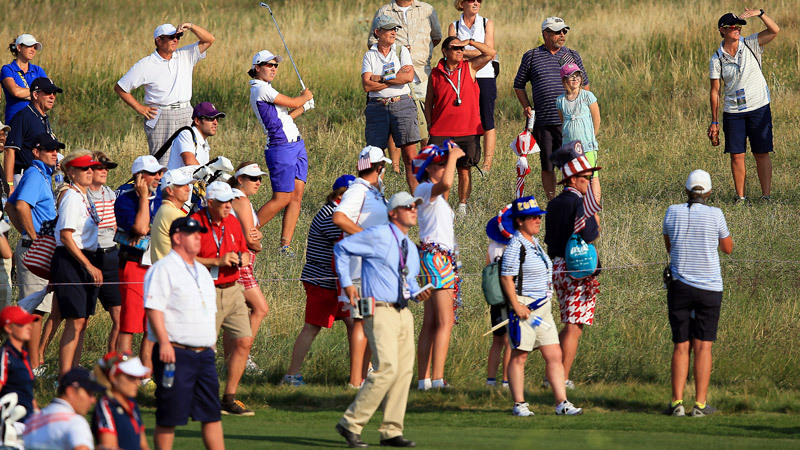 PARKER, Colo. -- In her first Solheim Cup, Spain's Carlota Ciganda managed to inadvertently stir up a bit of controversy, all with a wayward second shot. Europe leads the United States 5-3 after the opening day, but the day didn't "end" until around 10:30 p.m. ET, when the two captains, an assistant captain and two sheepish-looking rules officials explained their take on what had transpired about three hours earlier on the par-5 15th hole. Ciganda was playing in the first four-ball match of the afternoon with partner Suzann Pettersen against Americans Stacy Lewis and Lexi Thompson. Ciganda sent her second shot into the hazard. Pettersen did the same thing, and it took a few minutes to locate both balls. Pettersen was able to hit out, but Ciganda needed a ruling on where she could take a drop. That's when things got a little crazy. Lexi Thompson: Youngest ever for U.S. The Americans were already on or near the green. The rules official with the group tried to determine where Ciganda should take a drop. This is how official Brad Alexander, the manager of tour rules and competition, later explained it. Prepare yourself for some heavy-duty golf speak. "The point the ball last crossed the margin of the hazard was accurately established," Alexander said. "One of the options under Rule 26-1 C is for the player to drop her ball on the opposite margin of the hazard, equidistant from the hole. This point was also accurately established. "Rule 26-1 C allows the player to drop within two club lengths of that point on the equal and opposite margin. However, a mistake was made, and the player was allowed to drop behind that point in line with the flagstick." Alexander then summed it up: "The player dropped in the wrong place … she was given an incorrect ruling. She dropped behind that spot by approximately 40 yards. So 40 yards further from the hole than she actually was." And this was an advantage for Ciganda? "Yes," U.S. captain Meg Mallon said. "You'll see it on TV," Mallon said. Ultimately, Mallon was as upset that it took about a half hour for the officials to make a ruling as she was about the ruling being wrong. Lewis -- who is a rather emotional player anyway -- was getting more and more aggravated the longer the determination took. It ended up being about 27 minutes from the time they started the process to Ciganda hitting her third shot. "I'm very frustrated by the situation," Lewis said later. "I think there were a lot of things that went wrong within the ruling. You look at the length of time -- it killed the momentum of our match and [those] behind us. "The explanation did not make it more clear to me. It actually made me have more questions." All of this may have been moot if Lewis or Thompson had ended up getting a birdie on the hole, or even if Pettersen had been the one to scramble for the par, not Ciganda. But the Spaniard did that by making a putt from off the fringe. In a match where very little went right for Ciganda, the fact that she ended up being the one who halved the hole was a pleasant surprise for the Europeans and a big irritation for the Americans. "She was looking for her ball and worried about everything that was going on," European captain Liselotte Neumann said of Ciganda. "She knew she had to make the putt, and she made it." Had she not, the Americans would have won the hole, which could have impacted the eventual outcome – a 1-up victory for the Europeans. "There was a lot of complaining going on," Mallon said of the mess that the 15th hole turned into. "I don't know if there was a proper complaint, but there was a lot of commotion going on. Stacy was complaining all the way through, and Lexi wasn't happy as well. But we didn't discover that they had made the wrong ruling." Not until hours later, that is. One could point out, though, that even though they had to wait, Lewis and Thompson still had a chance to win the hole and didn't do it. And that Ciganda had to wait just as long, but managed to come up with the par. "I'm not pleased, but it's the rules of golf, and we have to accept that as a team," Mallon said. "We have to go out [Saturday] and play our best and try to get those points back."